Now that I have flexed my muscles on building a raised garden bed on my own, I have my work cut out for me to fill it with really good soil. 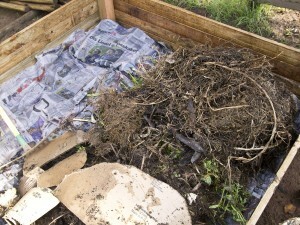 I have been doing my research on sheet mulching or sheet composting. 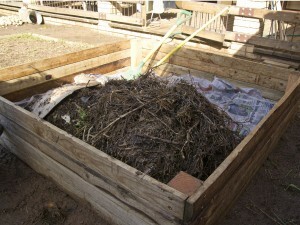 The main concept being composting in place. Its a way of eradicating weeds and building soil without using herbicides or tilling, of which both rupture soil ecology. I have found this in the e-book I’m reading – Gaia’s Garden: a guide to home-scale permaculture by Toby Hemenway – which has now become my bible! Sheet mulching is a variation on nature’s way of building soil by accumulating and breaking down organic debris from the top down! I thought this to be a practical and common-sense way of creating compost! So I have the perfect area to try this method. I have created an uber-large area to fill, so I’m hoping I have enough material to do it! I believe that it gobbles up organic matter! Gulp! 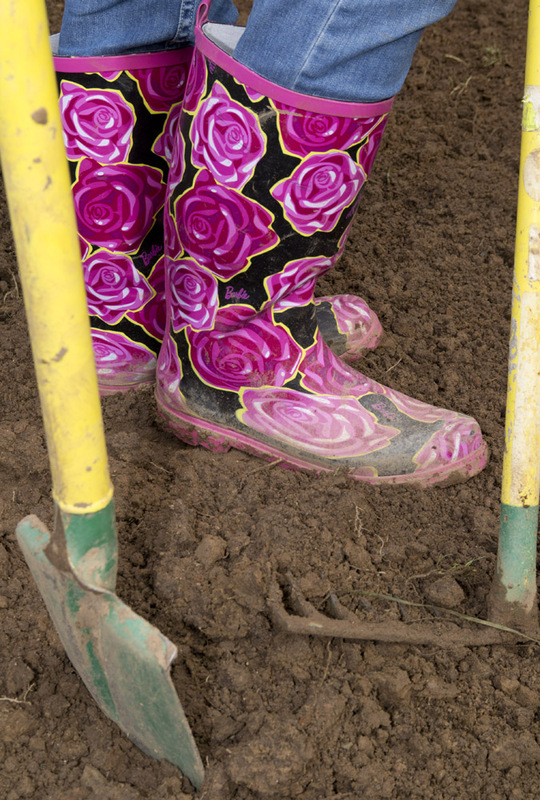 I started with the soil I was standing on – leave grass and weeds and anything that is growing there in place. Any knee-high grass can be mowed down and left there. Then lay down a deep stack of newspaper (minus any glossy sections) or corrugated box cardboard. This is to smother the weeds and prevent their seeds germinating. Now add soil amendments, i.e. lime, bonemeal, (depending on your soil’s needs), then add a thin layer of manure, then a 2.5cm layer of newspaper, then another thin layer of manure or nitrogen rich material, then a bulky layer (30cm) of organic matter like straw, finely ground bark, wood shavings with grass clippings. The Carbon/Nitrogen ration must be between 100:1 and 30:1 – if it is too high in nitrogen then it causes anaerobic decomposition and makes it smelly and slimy! Eeeuw! Don’t want that! To finish, add 5cm of compost/manure and top it off with straw, pine needles, sawdust or leaves or other seedless mulch. If you can’t find every item, don’t worry – sheet mulching is very forgiving. 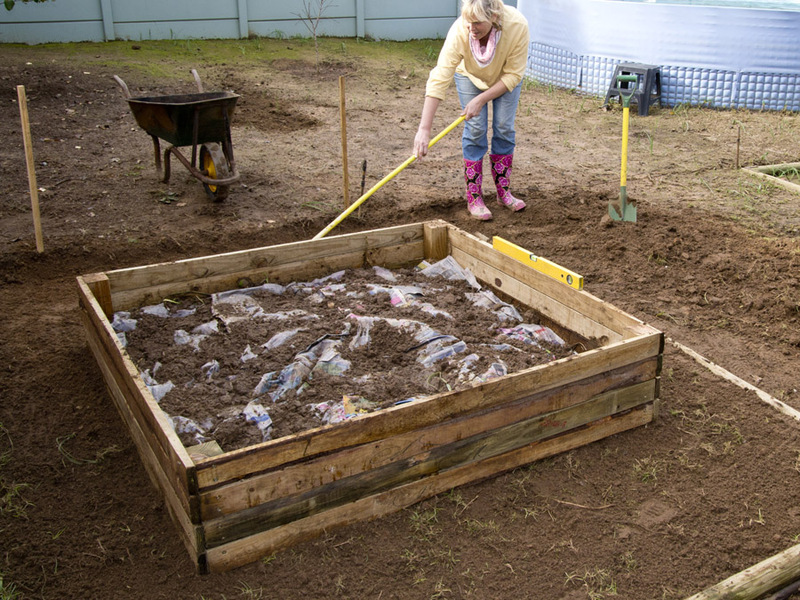 As long as you have enough newspaper or cardboard and organic matter of anykind, you’ll have good soil! Starting to look like Lasagne! Next layer to go go! I always have happy helpers! 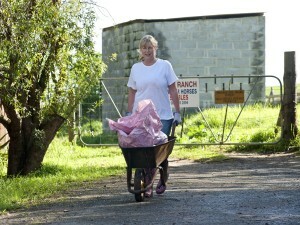 Bring on the local manure! Finding local manure was easy. My neighbour has 7 horses….Adding the horse manure was not as terrible as I had thought. I was expecting it to be a really smelly job, but on the contrary. The manure was rich and sweet smelling – what, you don’t believe me? I’m nearly done. I am looking for the top layer ingredient. I wanted to get straw today but the farms around here don’t have any! Oh, darn! I’m going to have to do search for some! Have fun – I am! Now we wait! I’ll keep you posted on my progress! Well-rotted manure is actually sweet smelling! 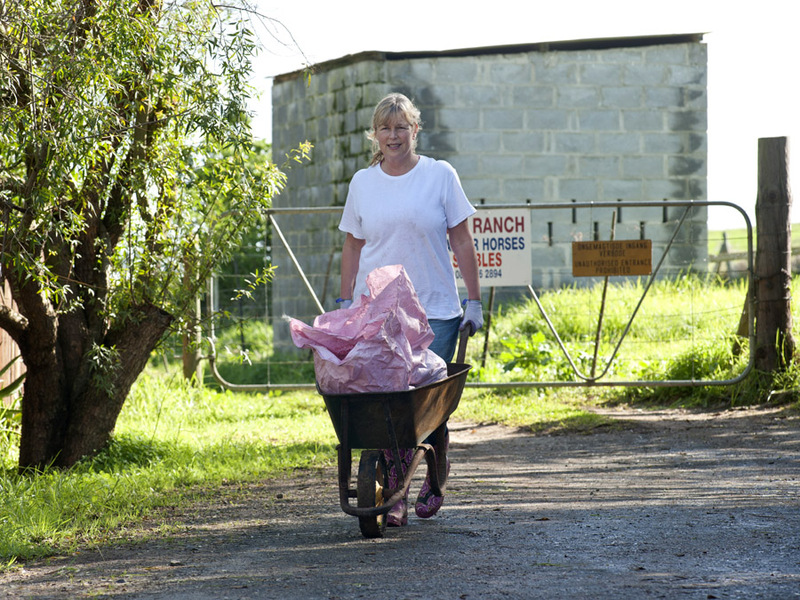 Adding the manure – nearly done! 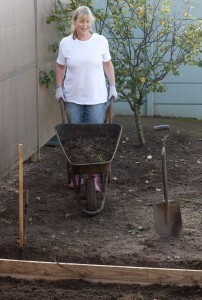 I am newbie gardner and this is my second season. we have a patch of land a 10×10 mostly that I want to use for my veggies next year. One question I had was, how is your compost mixer working ? Have you had any issues / good things to say about that ? permaculture is a great ethos, using what you have in the garden… and with rich rewards. 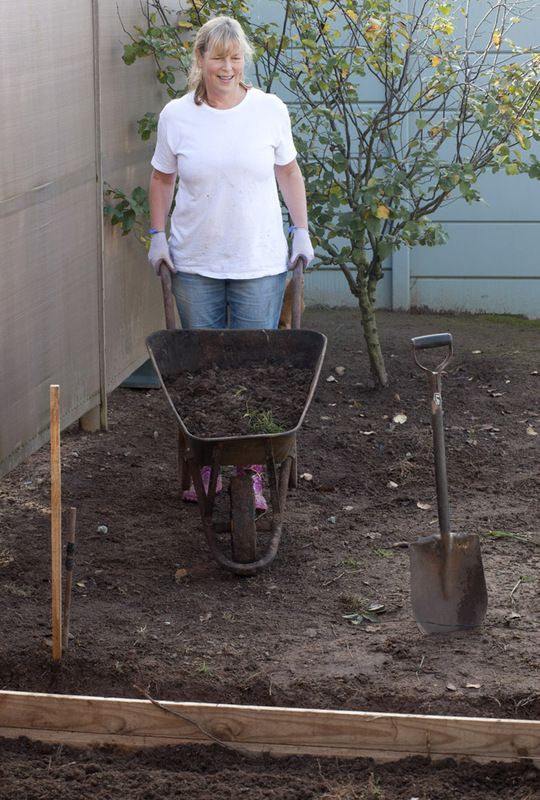 we built some beds for my mother in durban and aside from a bit of weeding, once you have prepared the soil, they don’t need much attention… good luck! I’m jealous of your ready access to manure! I generally have to make do with what the garden itself produces, though the wood burner does provide me with a steady supply of carbon and the lawn provides more nitrogenous greens than I really need, so I guess I have to make do. Yes, I am pretty lucky to have a great neighbour who allows me to help myself! I certainly won’t make a nuisance of myself, though! I love the research part of gardening to give me that confidence when I do start something I’m not sure of! Remember, I’m still a newby! I can’t wait to watch my garden grow! 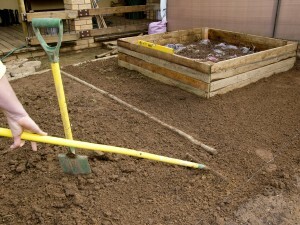 But I need some patience with the soil now. I am amazed at all the work you have been doing. It will be paying off in spades in short time. 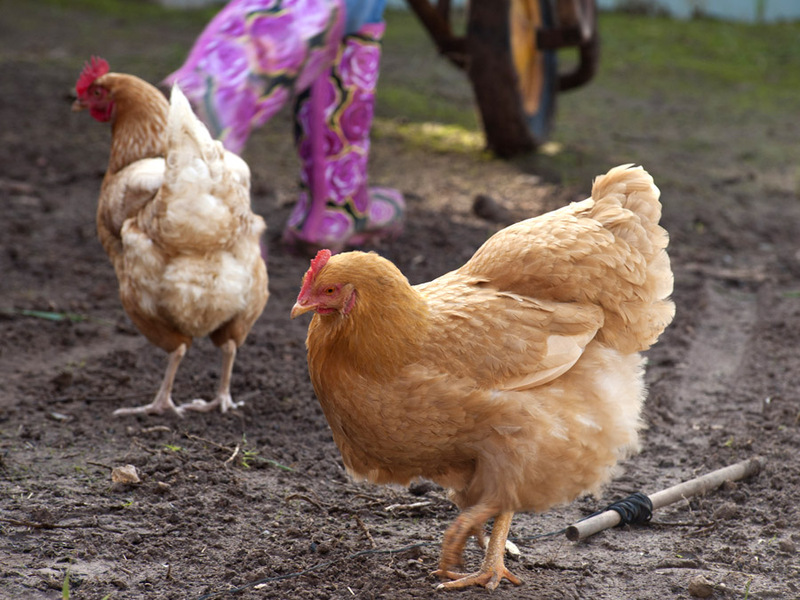 I just love that your chickens hang around. They are really nice pets. I hope so Donna – I am in my Happy Place when I’m in the garden, working and digging and my chickens are just the best! 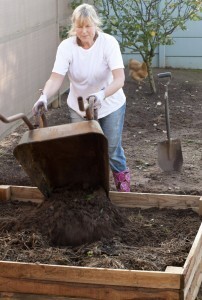 So enthusiastic when I arrive with my spade! I use permaculture techniques in my garden, mulching in particular. Much more labour saving and sensible than all that digging. Thank you Bridget, I like practical solutions to smart gardening . Permaculture makes the most sense to me. By the way – I love Daphne the Donkey – soooo cute!